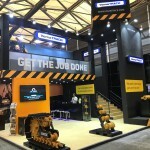 For the 4th time VMT International is attending the Bauma Fair in Munich. During the last edition in 2016 there were no less than 3,425 exhibitors and 583,736 visitors. At Bauma, you experience the entire industry in one place. With the highest concentration of innovations this will be an event to remember. The VMT International sales team is happy to meet you april 8th until april 14th 2019 at Hall A5, booth 214.